Full transcript of William Pitt Sotheby’s TEDx Talk: Guiding difficult decisions from “monkey brain” to “wise mind” at TEDxFultonStreet conference. For the past 20 years, I’ve been really working hard to try and help develop sales strategies for Fortune 500 companies and the high-end professionals that actually work for them, to develop a way for me to take two skills sets that I’ve learned from the past and I’ve studied: one of them being humanistic Buddhism, and sales psychology. And if you take these two and meld them together, I can actually help sales professionals identify the best way to get someone to say yes, or sometimes no, depending upon really developing that key component, which is identifying how do I get to a relationship. And most all of our relationships are driven off of really understanding where someone comes from. I’ll talk about one example today on how we do that. I’ll use a visualization for you. I want you to think about you’re going away, you’re taking a trip, it’ll be a nice, long weekend, you’re excited. But you have to leave somebody home in charge of the house while you’re gone. So you decide you’re going to leave George home. Now, what do you think your house is going to look like when you come back? If you have teenagers you already know the answer to this. Because it’s not going to be pretty. This is our mind. And inside of our mind, we have this process that happens all day long. We’re projecting forwards, backwards, analysis, thinking, it’s how we actually defend ourselves. And at the core of what we do in this process, we actually camp into two separate areas. Buddhists call this constant frenetic energy “monkey mind.” George. When you have this frenetic energy that happens all the time, we tend to develop two separate mindsets to protect ourselves. And the two separate mindsets are an emotional mind and a reasonable mind. We’ll talk about what these things look like. First things first is, let’s talk about a reasonable mind. What’s a reasonable minded person? 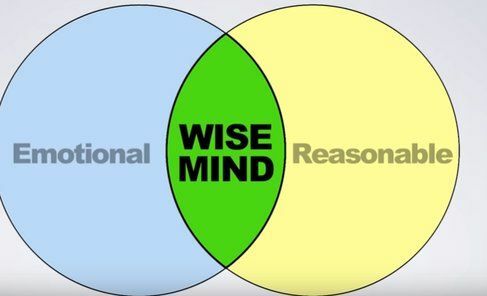 The reasonable mind is somebody that actually has linear thought process. They really prefer linear thought, They like things like crossword puzzles, Sudoku, they like thinking about things in a systematic fashion. This systematic fashion helps them seek and find comfort. The next part of this, though, is that emotionally minded person. I’ll put my hand up, I’m that person. The emotionally minded person seeks their comfort in drawing from happiness, joy, sadness, anger, frustration, moments like today, anxiety. And in that, it’s very difficult for somebody to make a conscious, healthy, yes or no decision. Why? Because when you’re based and camped out in those places, you can’t actually feel centered. In order to actually make the best decision in terms of a yes, or sometimes no, we actually have to find that center. And that’s what Buddhists called wise mind, that center piece, that also is known as intuition. So what does this look like in a real life practice? Well, I’ll give you a true story. We’re all familiar with one of my favorites, Muhammad Ali. Now, Muhammad Ali was known for that, what, emotion. He was always emotional. One of the things that Muhammad Ali was most famous for was that bravado that he always exuded. He had a fight coming up and he was being followed around by a boxing reporter. He was sitting on a plane and the stewardesses had come and told him four times to please put his seat-belt on so they could take off. And he was paying absolutely no attention to them. Emotional mind, reasoning, coming together. What does it look like when you’re talking to someone that is a reasoning mind in person? And what do you get? “I was on the way here, I was parked behind this blue car, I’m sure it was a Ford Focus. When I was waiting for us to get going, the light changed. I noticed we were on Smith Street and thought maybe I’d make an extra right. But there was a house that was for sale, I didn’t remember if we had that or not. But all of a sudden my mom called, and when my mom called…” some of you are laughing because you know this person. That can be stopped by asking the person, “That’s great. I totally understand that, but how do you feel when we’re late?” It changes the mindset. The fact that I actually shared that analogy means I’ll be sleeping on the couch tonight. But what does the other side look like? Well, the other side, we’re all really familiar with. The emotion, that set emotion that comes and gears up and what happens? Locked out to the rest of the world. All of a sudden, we’ve moved from that full-on emotional state, bringing it forward. Now, this is actually doable and possible because what happens in relationships, especially in a sales situation, is as we go to defend ourselves in high-stress moments, we pick one of those. So in my industry, when you talk to someone that may be selling a home, if you’re talking to someone that’s in full emotional state, because we all love our homes, you have somebody in that process that’s talking directly at all of these emotions: We lived here for X numbers of years, we’ve done all of this stuff, we remodeled the kitchen. Our children were born here, Timmy lost his tooth there, right. Mind you, Timmy’s in the kitchen having a full meltdown also. But all of this stuff that’s going on, well, you can be conscious of what state that person is in to ask them directly. I understand that. That’s all very, very true. But let me just – a couple quick questions. What do you guys pay every month in electric? I just want to write this down. What do you pay, like, landscaping? What’s the oil cost to you? And that’s that wise mind place where somebody can actually make the right decision for themselves based on that intuition and based on that wise mind. This is what we have, an extremely organic relationship opportunity with somebody, and it’s how we garner a good feeling. What people don’t realize is that by allowing someone, or helping someone, really, to find in somebody else, “Where are they? What spot is happening right now for me to relate to that, to connect to that moment?”, and then be able to help them shift slightly toward the middle to make that healthier decision actually makes me feel good. It allows me to connect to somebody in a deeper level, to have a completely different type of relationship with them. And by me doing that, when I have the ability to actually connect at that level, to pull that from somebody, I feel better. And when I feel better, it deepens my relationship. Now what does that relationship look like for that person? They gain trust. So if I can have someone gain trust, if I can have someone have better faith in my ability to work with them and help them, if I can help understand that mindset and shift them toward that center, well what have we really done both for them and for myself? We’ve just made George happy. Quiet that monkey mind and allow people to make healthier decisions for themselves by connecting with them in a completely different level.